Why we're fixated on the ethnicity and religion of the Boston bomb suspects. The big question, of course, is what was the motivation. 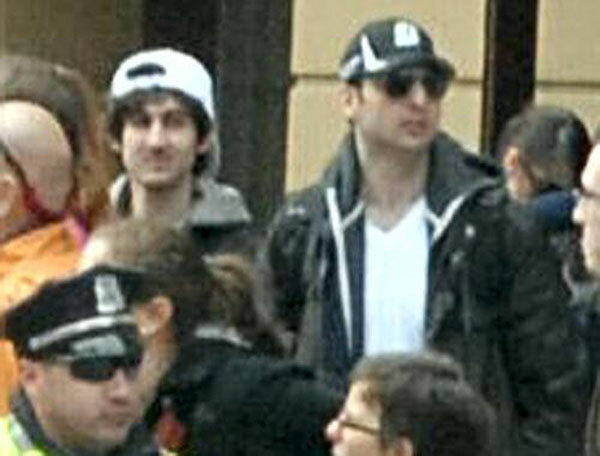 But even before the FBI made the Tsarnaevs’ photos public yesterday, and well before we knew their names or background (they’re from a region in Russia next to Chechnya, actually, and have lived in Boston about 10 years), we all have been trying to answer why by placing the two men somewhere on a racial, ethnic, religious, and ideological spectrum. In other words, were they the kind of white Christian Americans that society has a hard time calling terrorists, or were they the kind of foreign-looking, “dark-skinned” suspects that we have a hard time not calling terrorists? She, Kayyem, and other reporters, including a few on Fox, have laid out reasons that the two suspects might not be big-time Islamic terrorists: No one claimed responsibility for the carnage, as jihadist groups tend to; if they were part of a politically radical network, they probably wouldn’t have been so stupid as to rob a 7/11; high-school friends describe the younger brother as a normal teenager who partied, drank, and smoked. One reporter asked a question that, I thought, brought embarrassment to his profession. Reminiscent of how the political establishment demands that Obama say the magic word “terrorist” or else lose patriotism points, the reporter asked Tsarni point blank: What do you think of America? I hoped (though certainly never assumed) the Boston bomber ends up being a white non-Muslim American because in a country where white people are never collectively profiled, surveilled or targeted by law enforcement, that would best guarantee a measured — rather than a hysterical, civil-liberties-trampling — reaction to the atrocity. For this, I was lambasted by everyone from Rush Limbaugh to Bill O’Reilly to their thousands of followers for being “race obsessed” (O’Reilly, in fact, took a step into straight-up slander by subsequently claiming that I am hoping Americans kill other Americans in terrorist attacks). I, too, hoped the bomber was a non-Muslim white American. Last night, after the shootout, a taped loop showed a young blond man lying on the street, with his arms splayed out, surrounded by police with drawn weapons. We don’t know who he was, and he may have been an innocent bystander. But for a moment, I actually hoped that the “white cap” guy in the FBI photos was wearing a dark wig and that underneath he was a blond “domestic terrorist” trying to frame Muslims. Yesterday, after the FBI put out their photos but before we knew the suspects’ names or background, a lot of people didn’t know what to make of them: Were they white, Muslim, Italian, what? Erin Burnett sounded authentically perplexed, saying, “These two kids look like they’re very, very from here.” Most people figured them for college students, which in fact they were. Read Richard Kim on the Boston bombing and the West, Texas explosion, and why we irrationally pay more attention to terrorist deaths.